Simian Virology is the first text to comprehensively cover all currently known simian viruses. Chapters provide an overview of nonhuman primate models of medically important viral diseases as well as natural infections of nonhuman primates with human and animal viruses. The text covers a variety of topics including primate models of medically important viral diseases such as AIDS, hypotheses on the origins of epidemic forms of HIV, and viral diseases caused by non-simian viruses in both wild and captive primates. Alexander F. Voevodin, MD, PhD, DSc, FRCPath is Professor of Virology, President, Vir&Gen, Toronto, Canada. Preston A. Marx, Jr., PhD is Professor of Tropical Medicine, Tulane National Primate Research Center, Covington, Louisiana. Part I: Introduction to Primatology and Virology. 1 Classification of Nonhuman Primates. Part II: Simian Viruses and Nonhuman Primate Models of Viral Infections. 3 Lentiviruses in Their Natural Hosts. 5 Origins of Epidemic Forms HIV-1 and HIV-2. Section 1.2: Other Simian RNA Viruses. Section 2.2: Other Simian DNA Viruses. Section 3: Miscellaneous RNA and DNA Viruses. Section 4: Experimental and Natural Infection of Nonhuman Primates with Nonsimian Viruses. 23 Experimental Infection of Nonhuman Primates with Viruses of Medical Importance. 24 Natural Infection of Nonhuman Primates with Nonsimian Viruses. 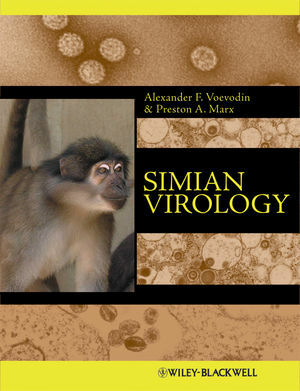 Simian Virology Visit authors Marx and Voevodin's website for more information and resources on Simian Virology.